Phantasy Star fans rejoice! A Phantasy Star adventure never in English until now. Although this isnâ€™t your average Phantasy Star game, itâ€™s a text adventure with role playing elements. If your life needs a little more phantasy then donâ€™t hesitate to play this game. Fantastic!~ New Genesis translations are a rare delight! Hopefully the methods used are transferrable to the others in the series... and we can get Anne's, Huey's, Shilka's, Amia's, Eusis', Nei's, and Rudger's translated eventually too. Ive played almost all the Phantasy Star games, and its cool how this game got translated and released. Disclaimer: This is not a rom request. I'm having trouble finding the rom. I look in the genesis section of rom sites and come up empty. Would it be categorized in a different section or is it known by another name? I'd love to play it, but I kinda need the game first. A google search of the title of the game with ROM attached should turn up results. Well, I feel foolish. Thanks. i hope they decide to get the other PS2 adventure games. also on the MIJET webpage he's asking around if anyone has the Megadrive Cart of Yu Yu Hakusho i wonder what that means. Wow 6 translations in such a short time, I definately hope they keep it up. Thanks for supporting the Genesis! You guys rock! Think that this being translated means that the other ones will be too? This may be a dumb question, but I keep wondering it every time I see the front page. Why are there dice all over the screen? i thought they were coins when i saw them, then i saw the sides, i guess they're just reeaallly flat dice? maybe its a tech of his like Setzers in ff6? I got in touch with MIJET and they verified they're planning on translating the rest of the series as the releases are made available. 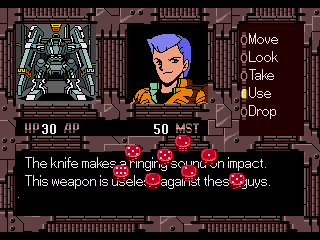 Each weapon has a number of dice associated with them. When the dice are rolled the total is multiplied by the number of dice to get total damage. Sounds like something outta Nethack. ^_^ So attack values for weapons are Xd6, where X depends on the weapon?